Made in Japan and crafted from ceramic, this sake serving set comes with a sake jug and two matching sake cups in a bold and unique contemporary design. 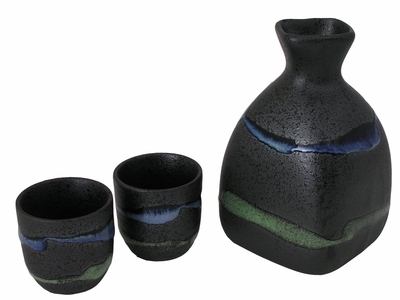 In a chic metallic black featuring the abstract motif of river stream in a charming blue and green, this sake set comes with a unique sake jug featuring a square rim with curved sides and two stylish sake cups. Featuring a smooth speckled finish, this sake serving set is an ideal gift for sake lovers. With the striking black metallic finish and the contemporary abstract design, this sake serving set is a modern and stylish addition for lovers of unique, minimalistic, and contemporary designs. Item comes packaged in a paper box. Hand wash is recommended for this item.